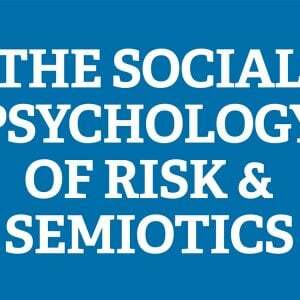 The study of semiotics is foundational to the Social Psychology of Risk. Semiotics is the study of signs, symbols, signifiers, what is signified and significance. A sign is anything that can stand for something else. Semiotics works in the individual and collective unconscious and makes up ‘the consensually validated grammar’ (code) of language and discourse in organisations. Language is not complete in any one speaker but rather exists only in collectivity, in the ‘i-thou’ of ‘meeting’. Our sign systems play a major part in how we construct social reality and our reality cannot be separated from the sign-systems in which they are experienced. Semiotics should not be confused with only the study of semantics and language, although words do matter. Semiotics understands that messaging and all communication are intertwined (coded) with the values, attitudes and beliefs in organising. Semiotics seeks to understand the many ways people come to belief and meaning through unconscious ‘codes’ and rules embedded in many communicating ‘devices’. Semiotics is interested in how meaning and purpose is ‘absorbed’ covertly, constructed and unconsciously experienced rather than what is contained in overt communications policy. 1. What do risk tools such as matrices (and other symbols) really communicate? 2. How are reductionist beliefs transferred through investigation models? 3. How does a pyramidic or hierarchy of controls semiotic influence the assumptions of safety culture? 4. Why is the concept of emergence, the unconscious or wicked problems so foreign to risk and safety? 5. What do various models (and symbols) in risk and safety communicate about human agency? 6. Does our organisational communications strategy frame and prime the right message? 7. What are the by-products and trade-offs in ineffective and poorly considered semiotics? 8. How do semiotics communicate and set the collective unconscious? 9. How does spin, propaganda and mis-information work? 10. Does our method, model and language in risk and safety hold together and communicate with consistency at all levels of cognition? These are just some of the questions that are tackled in the program. 1. Understanding how semiotics communicate to the unconscious. 2. How signs, symbols, text as symbol and cartographic work. 3. Making and communicating things of significance. 4. Who is a signifier? What is signified? How is language and signs a code? 5. Understanding pitching, framing, priming and anchoring messages. 7. Developing a sophisticated communications strategy for developing risk maturity and risk intelligence. 8. Developing semiosis and purpose in verbal, oral and written communications. 9. Understanding culture as the collective unconscious. 10. Understanding how archetypes influence outcomes. 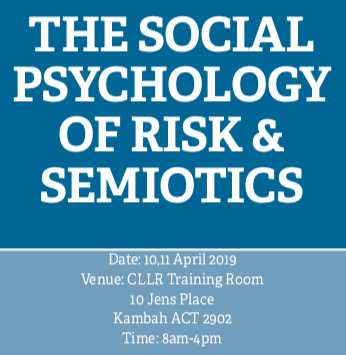 The program is introductory and suitable for anyone seeking to improve communication and maturity in risk intelligence in their organisation. This program is for anyone interested in messaging, communications and risk. It is not limited to people in the risk, safety and security industries but to anyone in leadership interested in how beliefs, values and meaning are constructed and sustained.